I am a mean baker. You should be so lucky as to have me make you a birthday cake. Current plan for my roommate's: yellow cake, three layers, cream cheese frosting on the outside, crunchy Biscoff spread on the inside. See? Evil genius. I have also been known to dabble in chocolate cream cheese, pumpkin yogurt, and cheesecake fluff fillings. My culinary skills, however, are pretty rudimentary. Unless I set my mind to a particular recipe, I'm more throwing things together than I am really cooking perse. And on that note, here's another one of my "recipes" - nothing groundbreaking, just an idea with instructions for assembly, like with The Cheater's Grilled Cheese. I'm the food equivalent of IKEA. And so, without further adieu, I give you The Cheater's Open-Face Egg & Cheese Sandwich. This is another great one for when you'd like some tasty, hot food with as little effort as humanly possible. And this one's pretty effortless. Observe. Pop the bread in the toaster. Put your spinach in a small bowl or a saucer with a decent lip to it. (If your spinach is frozen, thaw it first.) Crack open your egg and pour it over the spinach. If you prefer a good scramble, mix it all up. If you like the yoke intact, just kinda spread the white of the egg so that it covers the spinach. 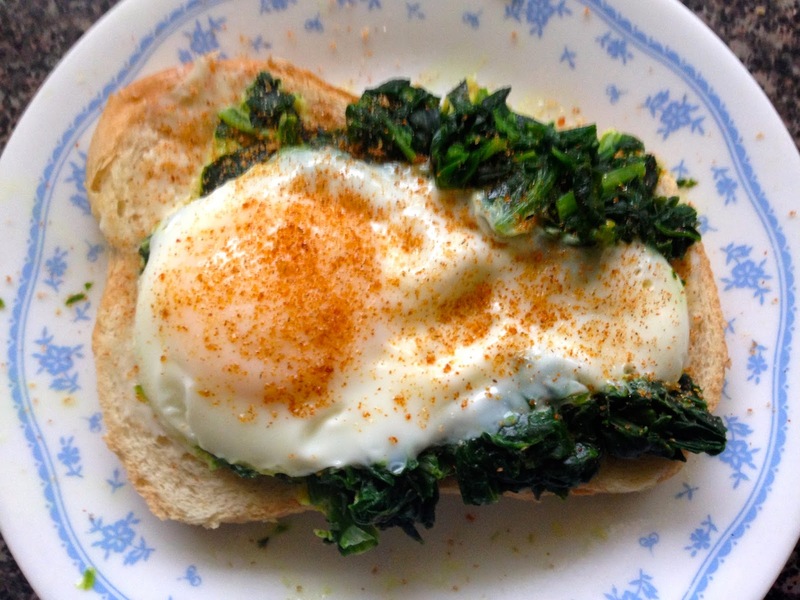 Stick your spinach-egg concoction in the microwave (YES I SAID THE MICROWAVE WE'RE CHEATERS, REMEMBER?). Nuke that sucker to your desired specifications. I like my yoke to stay a little soft and I know my microwave runs hot, so I generally go for about 40 seconds; this gives me a solid white but the yolk still gives without exploding as I bite into it. For a runnier yoke, try 30 seconds. For a hard yolk, try a full minute. Basically, experiment based on what you're into. While you're waiting, retrieve your toasted bread, spread the cheese wedge onto one side, and place it on a plate (cheese side up, although I'd imagine this goes without saying. Like the car in The Phantom Tollbooth). Take your egg-spinach mass out of the microwave and observe how nicely the two elements have fused into one fabulous round. Carefully slide it out of the bowl and onto the cheesy side of your bread. Now for the garnish! Sure, I could say "salt and pepper to taste" and call it a day, but where's the fun in that? No, I like to hit my egg with a dash of sweet-and-savory barbecue spice rub. I bet garlic salt would be good too, or Old Bay goes with everything. Hot sauce fiends could indulge with success. Nose through your spice cabinet and see what strikes your fancy. There you have it! Another easy, healthy (protein and veggies and low fat cheese! ), cheap, minimal-equipment-necessary set of food assembly instructions. Now here's a question: yolks or no yolks? IT GOES WITHOUT SAYING BUT YOU STILL HAVE TO THINK! Oh I love that book.